With two separate alignments of Route 66 in Litchfield, 1930-1940 and 1940-1977, we get twice the nurturing from the Mother Road. Pick your side and drive down a stretch of blacktop more American than apple pie – but don’t worry, we’ve got apple pie too. Learn about classic attractions you can find on the 1930-1940 Route 66 alignment in Litchfield. The last of its kind, the Sky View Drive-In first opened its gates in the spring of 1950 and remains the only original operating drive-in movie theater on the Illinois stretch of Route 66. 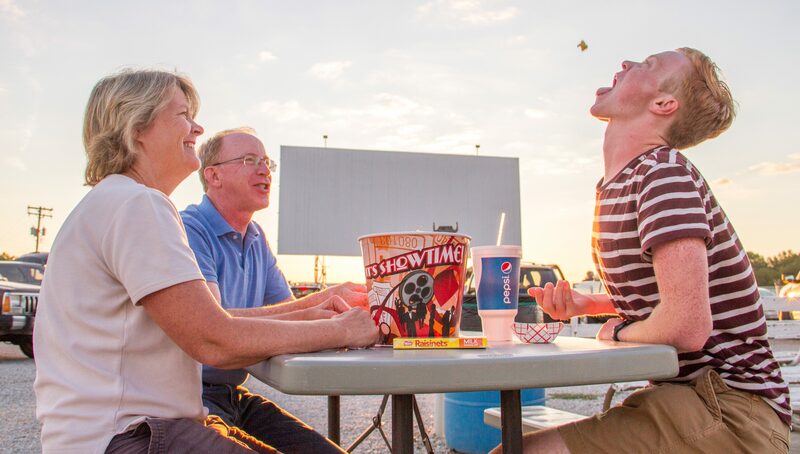 The fame doesn’t stop there, the Litchfield Sky View Drive-In is the oldest continuously operated drive-in from Chicago, IL to Santa Monica, CA and can be found in the Illinois Route 66 Hall of Fame. From April through mid-October, you can enjoy a first-run or throwback double-feature for one super-low ticket price. Don’t forget to show up at least 10-minutes early for the vintage “10 minutes to show time” pre-roll. For prices and show times, visit their website. If you’re looking for Route 66 in Litchfield, this is the place to start. Step back in time with an eclectic blend of artifacts from Litchfield and Route 66 history – including an ORIGINAL Route 66 road-sign. 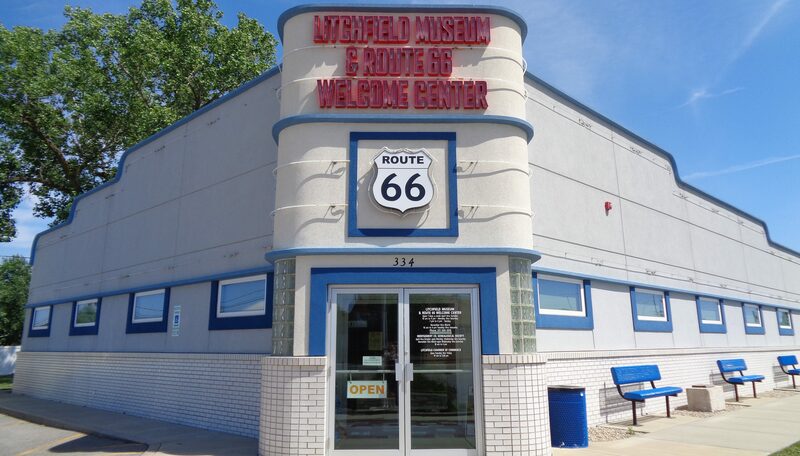 Located on the heart of Litchfield’s Route 66, all other Route 66 attractions are in walking distance or a short drive. More information is available at www.litchfieldmuseum.org. 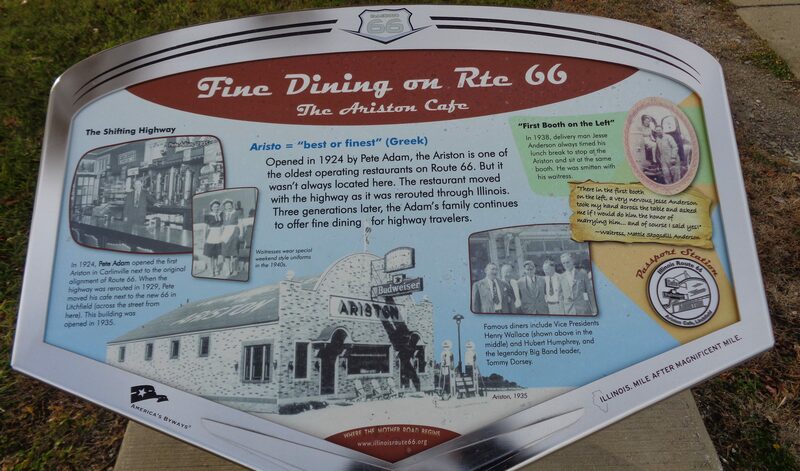 Another Mother Road original, the Ariston Café is the oldest continuously operated restaurant along all of Route 66. 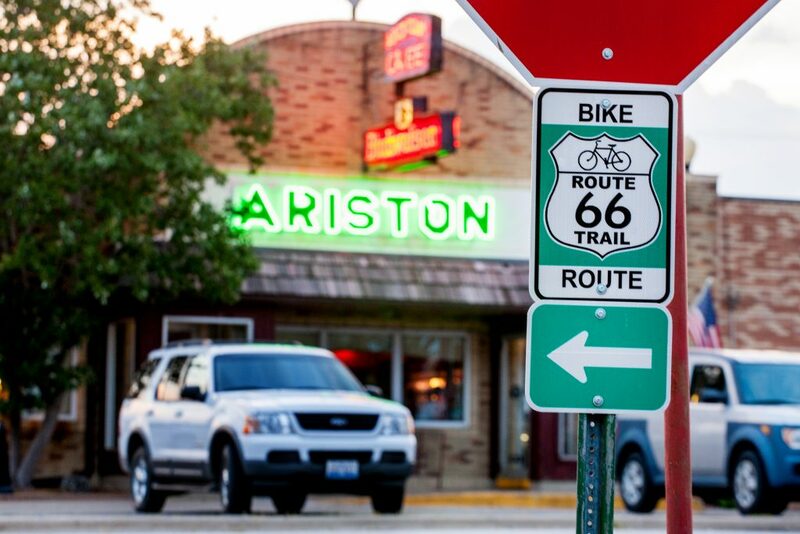 Serving up tasty Midwest favorites, from pork tenderloin to fried chicken and the largest dessert tray you’ve ever seen, the Ariston is the perfect place to stop for a bite on your Route 66 adventure (or any time really). 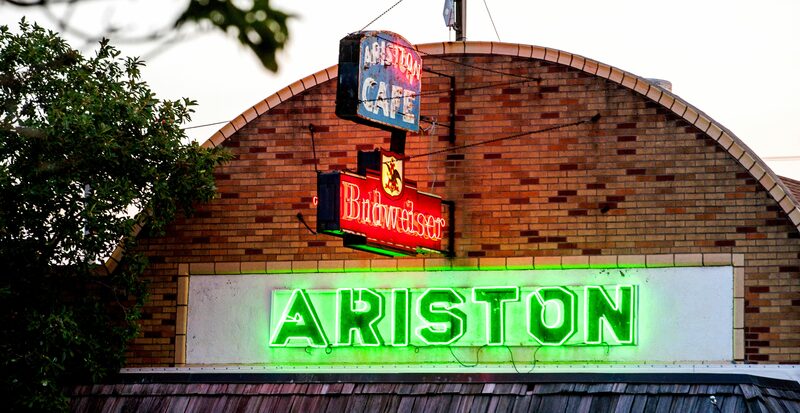 The Ariston Café is on the national registry of historic places and holds a spot on the Route 66 Hall of Fame. Visit their website to learn about the Ariston’s history and check out the menu. What would Route 66 be without a couple roadside surprises? Stop by one of our three wayside exhibits along the 1930-1940 alignment for a photo and some Mother Road history. Wayside exhibits can be found at the Ariston Café, Niehaus Cycle Sales and The Litchfield Sky View Drive-In. More roadside exhibits can be found all around Illinois, courtesy of the Illinois Route 66 Scenic Byway. Located on Historic Old Route 66, Niehaus is a popular stop for motorcyclists cruising the Mother Road. 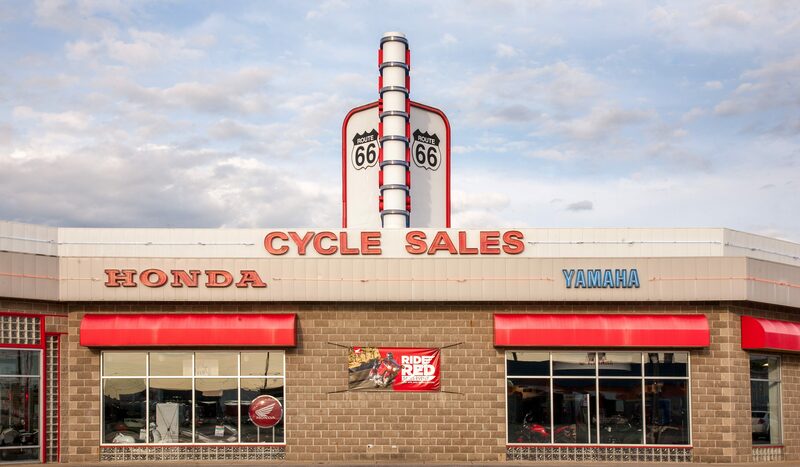 Niehaus Cycle Sales opened in 1971 and has been on both alignments of Route 66. Since their opening, they have been a Honda-Yamaha dealer. Now as the largest new and used Gold Wing and Trike dealership in the Midwest, you’ll definitely find a few shiny toys to keep you busy. Check out the inventory on their website. 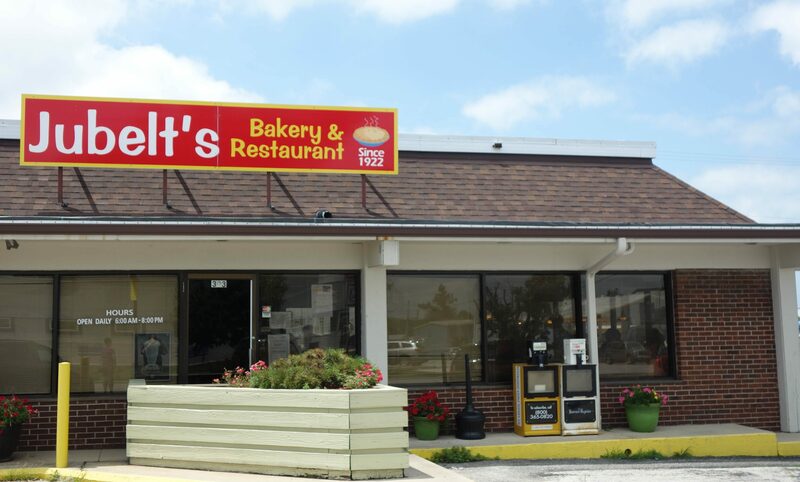 Also in the Illinois Route 66 Hall of Fame, Jubelt’s Bakery & Restaurant is the right stop for a fresh pastry and a cup of joe. Don’t miss their best-selling Tea Cookie! With delicious, hearty meals and baked goods served all day long, there’s no better way to start the day (or continue it). To view the menu, check out their website. Want to get closer to the Mother Road? Grab a bike, and a portion of Litchfield’s Route 66. The trail is indicated by green and white “Bike Route 66” road signs, and is a part of the Illinois Route 66 Bike Trail Route.